Department of Oral and Maxillofacial Pathology, I.T.S.-C.D.S.R., Muradnagar, Ghaziabad, U.P. Aggressive fibromatosis is a comparitively rare tumor with unpredictable growth and varying local recurrence rates. It does not develop distant metastases but locally it shows an aggressive and infiltrative behavior. Clinically, aggressive fibromatosis manifests as a painless, firm, often rapidly enlarging mass, fixed to underlying bone or soft tissue. It is never encapsulated. 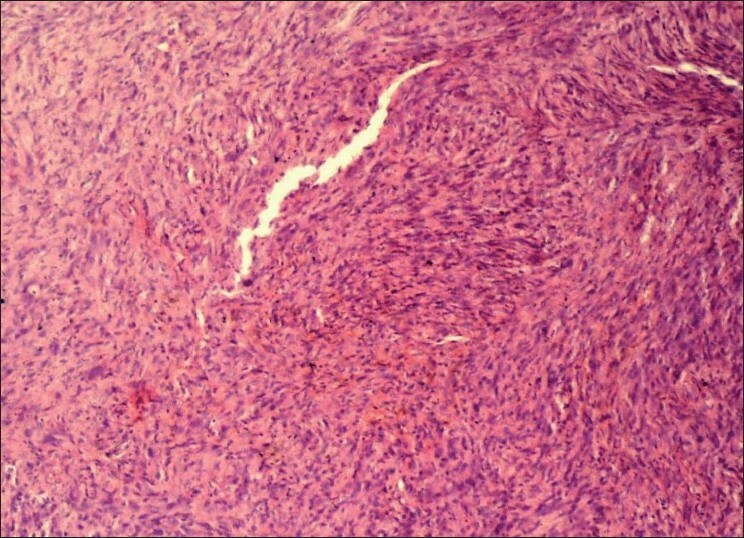 Histologically, it is rich in collagen and fibroblastic cells that are devoid of hyperchromatic or atypical nuclei, but with more variable cellularity in different tumor sections. Here, we report a case of fibromatosis involving the anterior maxilla. The pathological diversity in all the areas was analyzed in great detail with emphasis on the histopathologic parameters which aid in its diagnosis. A 21-year-old male reported with a chief complaint of swelling and pain on left side of the face since 1 month. Past history revealed that the pain subsided on intake of medicines prescribed by a local practitioner, but the swelling did not subside. Patient had a history of pus discharge since 2 days. Intraoral examination revealed swelling of size 3 × 3 cm in the left anterior maxillary region, with ill-defined borders. On palpation, it was soft in consistency. No lymph node involvement was observed. On radiological examination, an osteolytic lesion with irregular margins was seen in the upper occlusal radiograph. The computed tomography (CT) scan revealed soft tissue mass perforating the anterior wall of maxilla and palate. The provisional diagnosis was of central giant cell granuloma. An incisional biopsy was performed and gross examination showed four brownish soft tissue bits with one larger bit measuring 3 × 1.5 cm and three approximately equal bits measuring 1 × 1 cm. 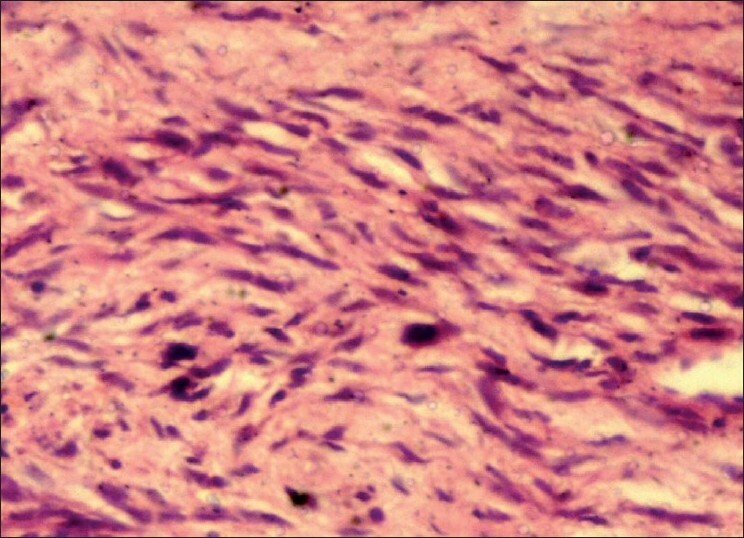 Microscopic examination revealed a connective tissue proliferation of predominantly fibroblastic cells in a background of moderate amount of collagen tissue. The pattern of arrangement varied from sheets to storiform, and to a certain extent, was in a fascicular pattern [Figure 1]. The cells were large, oval and fibroblastic in nature, but pleomorphism was abundant. Pleomorphic cells [Figure 2] showed a range from elongated flattened nuclei to a large giant cell like elongated nuclei. Cells showed moderate to abundant cytoplasm. A few areas of the section were predominantly spindle and wavy in nature [Figure 3]. The blood vessels seemed to be constricted due to the high proliferative nature of the cells around. Nucleus of the tumor cells showed a clear nuclear membrane, but in some areas, condensation of the nuclear material and two or more nucleoli were seen. Mitotic figures were present but were not seen uniformly throughout the section [Figure 4]. A final diagnosis of aggressive fibromatosis was assigned. A small panel of antibodies including S-100 protein, smooth muscle actin (SMA), desmin and vimentin would in most cases help in establishing the diagnosis. Fibromatosis is generally positive for vimentin. However, it should be pointed out that immunohistochemical studies have shown myofibroblastic differentiation in some cases of fibromatosis. Thus, in such cases, SMA would also be positive along with vimentin. 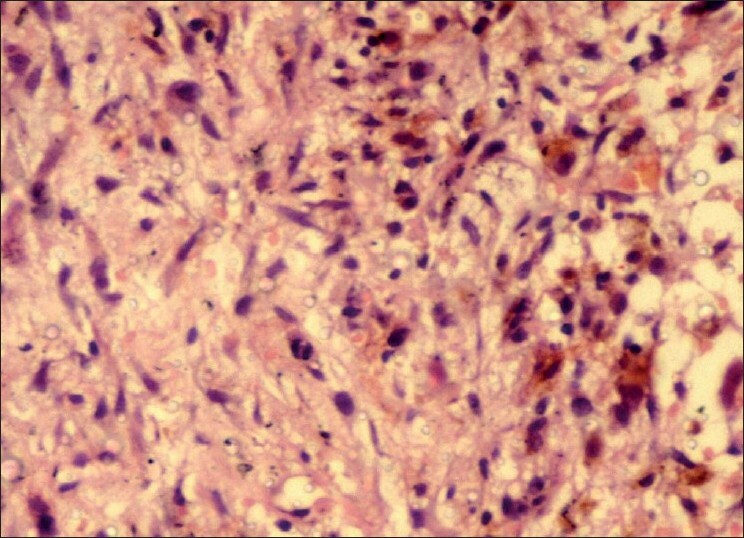 A case of fibrous histiocytoma is positive for vimentin and can be variably positive for actin. 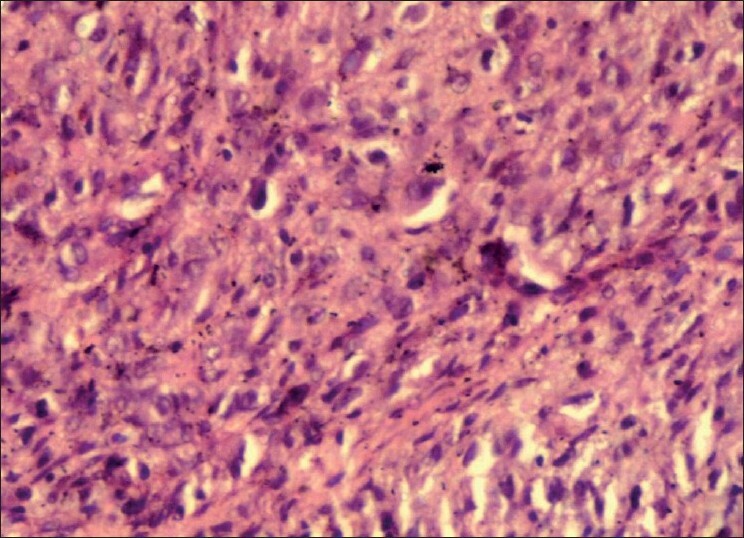 Histopathologically, our differential diagnosis narrowed down to aggressive fibromatosis and low-grade fibrosarcoma. So, in our case, immunohistochemistry was not utilized since vimentin is positive for both the lesions. The final diagnosis of aggressive fibromatosis was based on a number of factors which included spindle-shaped monotonous population of fibroblasts arranged in a whorl like and fasciculated pattern and the presence of collagen. The cells were mature in appearance and the presence of few typical mitotic figures was noticed. 1. Fowler CB, Hartman KS, Brannon RB. Fibromatosis of the oral and paraoral region. Oral Surg Oral Med Oral Pathol 1994;77:373-86. 2. Masson JK, Soule EH. Desmoid tumours of the head and neck. Am J Surg 1966;112:615-22. 3. Baerg J, Murphy JJ, Magee JF. Fibromatosis: Clinical and pathological features suggestive of recurrence. J Pediatr Surg 1999;34:1112-44. 4. Tse GM, Chan KF, Ahuja AT, King AD, Pang PCW, To EWH. Fibromatosis of the head and neck region. Otolaryngol Head Neck Surg 2001;125:516-9. 5. Watzinger F, Turhani D, Wutzl A, Fock N, Sinko K, Sulzbacher I. Aggressive fibromatosis of the mandible: A case report. Int. J. Oral Maxillofac Surg 2005;34:211-3. 6. Vally IM, Altini M. Fibromatosis of the oral and paraoral soft tissue and jaws- Review of literature and report of 12 new cases. Oral Surg Oral Med Oral Pathol 1990;69:191-8. 7. Seper L, Burger H, Vormoor J, Joos U, Kleinheinz J. Aggressive fibromatosis involving the mandible - Case Report and review of literature. Oral Surg Oral Med Oral Pathol Oral Radiol Endod 2005;99:30-8. 8. Enzinger FM, Weiss SW. Malignant fibrous Histiocytic Tumors. In, Soft tissue tumors. 2 nd ed. New Delhi: B.I Publication Pvt. Ltd; 1988. p. 357-9. Ndzengue, A. and Mora, M. and Iqbal, S. and Becher, R. and Kchao, S. and Rosal, Z. and Posner, G.L. and Jaffe, E.A. and Adler, M. and Guillaume, J.